Chances are if you're a fan of horror, you've seen most (if not all) of the movies I've reviewed. I don’t review first-run movies that are still in theaters. Instead, I stick to movies I’m able to enjoy in the comfort of my own home… high as hell. I'm all about harm reduction. Maybe it's just me being overly cautious, but I'm not comfortable getting intoxicated in public, let alone a movie theater. And that goes for alcohol too. It really just comes down having as much control over my environment as possible when I decide to get baked. So yeah, that was a long explanation as to why I don't review movies that are still in theaters. But I felt the need since there have been a few requests from people to review flicks that haven't reached home video yet. Which brings me to Get Out - a movie I’m certain every horror fan has already watched. If you haven't, shame on you! But that’s not why you're here is it? Yes, you've probably seen the movie. The question you have is should you watch it again stoned? To find out the answer, we must first find out which strain was selected for this particular evening. It was a Friday night so I decided to change things up with a sativa and grabbed some legendary Sour Diesel. It wouldn't help my insomnia, but it did get my mind and body into a comfortably euphoric state while also easing my joint pain. It didn't produce any couch-lock effects that I appreciate while watching TV, but I was too high to care. Sour Diesel buds are light green in color with rust colored hairs and packed with frosty trichomes. Just as the name implies, the smell is pungent and heavy on the diesel with a touch of pine. After sparking up the bowl and taking my first rip I was able to appreciate the earthy flavor and smooth inhale. I may have kept the smoke in my lungs for a bit too long because the exhale wasn’t as smooth and triggered a pretty intense coughing fit. My lungs tightened up and my head instantly felt like it was 5 pounds heavier. Perfect time to get the movie started! Get Out is the brainchild of first-time director Jordan Peele and begins innocently enough with a black man walking down a suburban street at night. The sidewalks are empty and only a single car is on the road slowly following the man. When he stops walking, the car stops. When he decides to "keep on walkin'" the car begins to follow again. Everyone who's ever walked alone at night can relate to this type of fear and the movie perfectly executes the tension and inner-dialogue going on in his mind. My heart raced as I anxiously watched the scene play out knowing it wasn't going to end well. Of course, there's a good chance my racing heart was a side-effect of the Sour Diesel bombarding my endocannabinoid system, but whatever. The man eventually decides to change course in an attempt to avoid the trailing car. It's no use. A masked assailant sneaks up on the man, chokes him out, then stuffs him into the trunk of the car and drives off. Part of its visceral quality is that it's all presented as a single shot. No cuts. Perfectly choreographed to make you feel like you're right there watching it happen in real time. It's terrifying, it's uncomfortable, and that's how the movie starts! Buckle up, kids. It's going to be a crazy ride! I would've voted for Obama for a third term if I could. 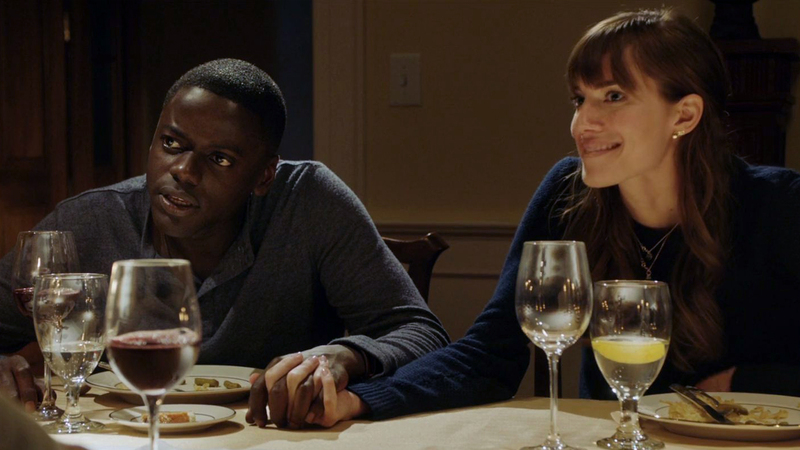 The movie stars Daniel Kaluuya (Chris) and Allison Williams (Rose) as an interracial couple who's off to meet Rose's parents and spend the weekend at their suburban home. Chris is worried about how Rose's parents will react when they meet him since she's never told them he was black. But Rose assures him that everything will be fine. When they ultimately arrive at the house, everything does appear to be fine... maybe a little too fine. The father, Dean, a doctor (Bradley Whitford) and mother, Missy, a psychiatrist (Catherine Keener) seem like they're the definition of the perfect American marriage. Things get a little odd when their live-in servants, a maid and gardener, are introduced - both of whom are black. It's hard not to immediately think "slave". But once again, Rose comes in to ease Chris' worries. She explains that they both cared for her ailing grandparents when they were alive. Once they passed, they were already "part of the family" so her parents simply allowed them to stay. Again... maybe a little too nice. It's no wonder this movie shot to number one in the box office when it was released. It's a smart critique of how racism still exists today wrapped up into a modern-day horror masterpiece. Horror is the mechanism, but exposing how racism still lingers in places you wouldn't expect is the message. Often times the most racist are those who are also the most outwardly "progressive". This point is driven home when Rose's father expresses to Chris that he "would've voted for Obama for a third time if I could". Maybe it's just me, but that sounds like a bit of overcompensation... almost defensive. He might well have said, "I have a lot of black friends." Are either of those phrases outwardly racist? No. But that's the whole point of the movie. That evening Chris sneaks out for a smoke (he's trying to quit) and witnesses both of the servants acting strange. The gardener sprints around the estate nearly running right into him and the maid appears in a trance-like state staring out her window. When Chris finishes his smoke and returns to the house, Missy spots him and invites him to chat. He sits across from her and Missy begins going to work by first asking if he's comfortable. Then she asks if he smokes in front of her daughter and offers to help him quit through hypnosis. Her questioning becomes more and more personal until she suggests he "sink into the floor". And sink he does. The now famous image of Chris paralyzed, horrified, helpless, tears streaming down his face. He falls deep into the "sunken place" as he looks through a window into the conscious world. His screams are silent. The whole scene is unnerving. In fact, I'm happy I didn't choose a more psychedelic strain like Gorilla Glue #4 or Blackwater that make me feel like I'm sinking into an underworld. Probably would've been too much for my mind to comprehend. And then just like that, he wakes. Safe in bed he tells himself it was just a nightmare. This is when Get Out really turns up the heat. The events that unfold continue to heighten and become even more uncomfortable until the terrifying climax when the real motive behind the meet-the-parents weekend getaway is uncovered. If you've seen the movie you're already well aware of the the twists and turns of the final act. If not, you'll thank me later that I didn't spoil anything. 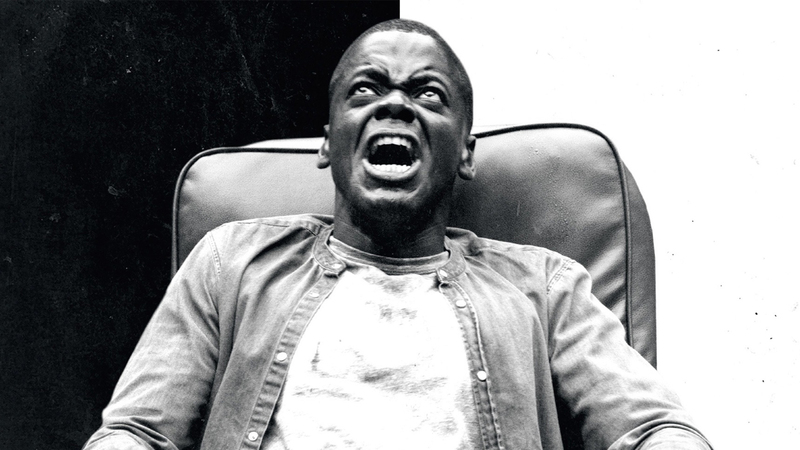 Either way, high or not, Get Out is easily my favorite horror movie released in 2017. What about you? Have you watched Get Out high or otherwise? Have you ever tried Sour Diesel? What are your thoughts? Please leave a comment and let me know. In the meantime please don't forget to follow Bloody High on Instagram, Twitter and Facebook.